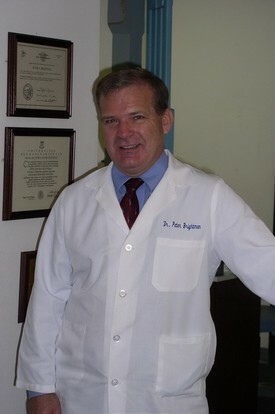 Dr. Peter Brightman graduated from Boston College with Bachelor of science in Chemistry, he then attended the University of Pennsylvania, school of Dentistry where he received is D.M.D. (Doctor of Dental Medicine), He then completed his General Practice Residency in San Diego at the Naval Regional Medical Center where he mastered his training in Oral Surgery, complex surgeries, and molar root canals. Dr. Brightman spent 2 1/2 years on the USS Bellea Wood (LHA-) as a Dental Officer and 1 year General Practice Residency. He then continued his education at the International School of Theology. •1977 - 1981 University of Pennsylvania, School of Dental Medicine, Philadelphia, PA: Doctor of Dental Medicine. •1981 - 1982 General Practice Residency, Naval Regional Medical Center, San Diego, CA: Certificate of Completion. •1986 - 1989 International School of Theology, San Bernardino, CA: Theological Studies. •1981 - 1986 Active Duty Dental Officer, Dental Corp, United Stated Navy. •1991 - 1996 Partnership at Dental Associates of Corona, Corona, CA: Comprehensive General Dentistry. •1980 - 2003 Dental Officer, Dental Corp. United States Naval Reserves: Retires Captain. •1996 - Present Private Dental Practice, Corona, CA: Comprehensive General Dentistry.